Blakeney National Nature Reserve01263 740241workSailingThe Nature Reserve is a fantastic spacious landscape with salt marshes, sand and shingle spit, sand dunes and horizons stretching far out to sea. Blakeney Point is home to a colony of Common and Grey seals that are here most of the year round and can be seen from any of the ferry boat trips that leave from Morston Quay. The Nature Reserve is internationally recognised as an important breeding area for sea birds and a wide variety of other birdlife that changes with the seasons. The Point has the distinctive Lifeboat house that provides an insight to the history of the point and is also where the National Trust wardens live and work to protect and conserve the wildlife and landscape. The salt marshes supports an interesting range of seaside plants creating an intriguing habitat and surroundings for refreshing long or short walks for all visitors. The Visitor Centre at Morston Quay provides further details on the area's attractions and a useful information point for visitors to get an understanding of the work the National Trust is undertaking to preserve and manage the Nature Reserve. View of Blakeney Point and the Lifeboat house in the background. 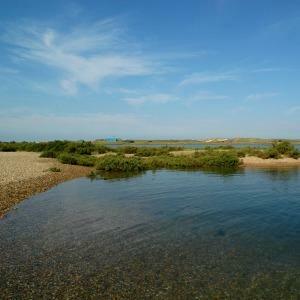 The Nature Reserve is a fantastic spacious landscape with salt marshes, sand and shingle spit, sand dunes and horizons stretching far out to sea. Visitor Information Centre opening times subject to tidal activity and ferry boat operations - limited opening from November to February. Morston Quay and Blakeney are all off the A149 Cromer to Hunstanton road. From Sheringham station it is 8 miles to Blakeney Point.